Too Hot To Cook-Healthy Fat Salad | Food It Yourself! It is too hot to cook in the Bay State tonight. Nights like this make the prospect of ordering take out look mighty tempting. Mr. Food It Yourself will, on occasion, simply call for a pizza. No shame in that. However, most often by far we turn to our repertoire of meals that do not heat up the kitchen. A recently discovered favorite: tuna salad with avocado. I know what you are thinking, but trust me it is delicious. I first learned of this concept from fellow blogger and fellow foodie Apple Moskowitz. She simply recited the recipe to me- canned tuna, diced avocado, a little red onion, salt, pepper, and little olive oil. I am not a huge avocado fan. I do like tuna and cannot stand mayonnaise, so I decided to give it a try. Here is how I did not cook dinner tonight. 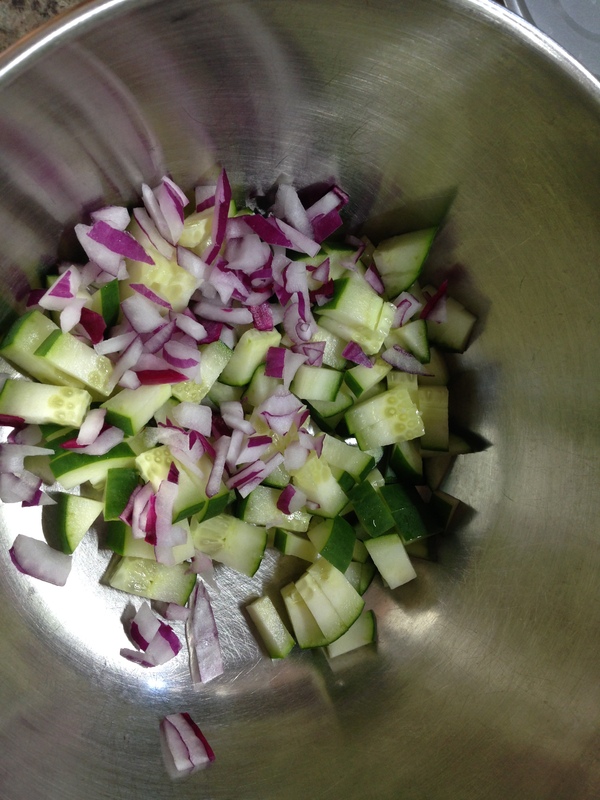 I diced some red onion small; I have substituted green onion before. I also added diced cucumber for some extra crunch. I have discovered that the smooth-skinned “Florida avocado” is less pasty than the lumpy “California” type. I think it is the pastiness that turns me off. Also, the pits usually pop right out of these guys, so no need to struggle with that. This was a big one, so I only used half. This is the real secret to this dish- tono. You might find it next to the regular canned tuna, or you might find it in with the Mediterranean foods. 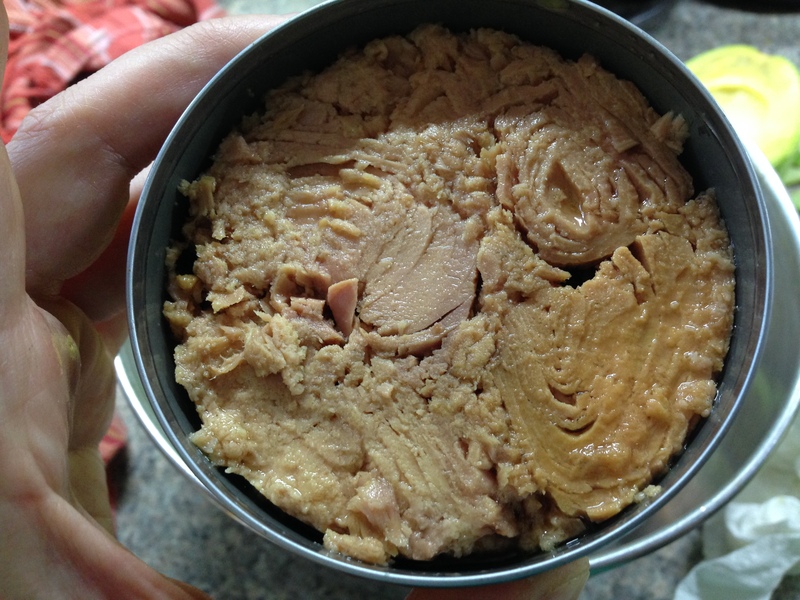 It is really good quality tuna canned in olive oil. It is a little pricier than the “regular” stuff, but it is still cheap in the context of super tasty protein. I used two cans, drained lightly. Bonus- no need to add more olive oil. A dash of salt, a few grinds of pepper and a quick stir to combine. 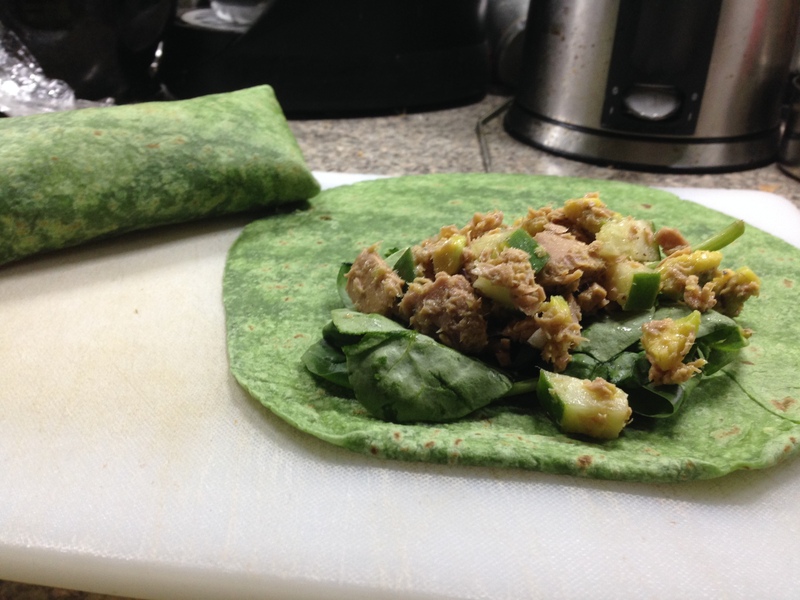 Here it is, with spinach leaves on a spinach wrap. No cooking, no added heat in the kitchen, minimal clean up- this is the perfect summer supper. It makes for a surprisingly satisfying meal. It is also a meal full of healthy fats. 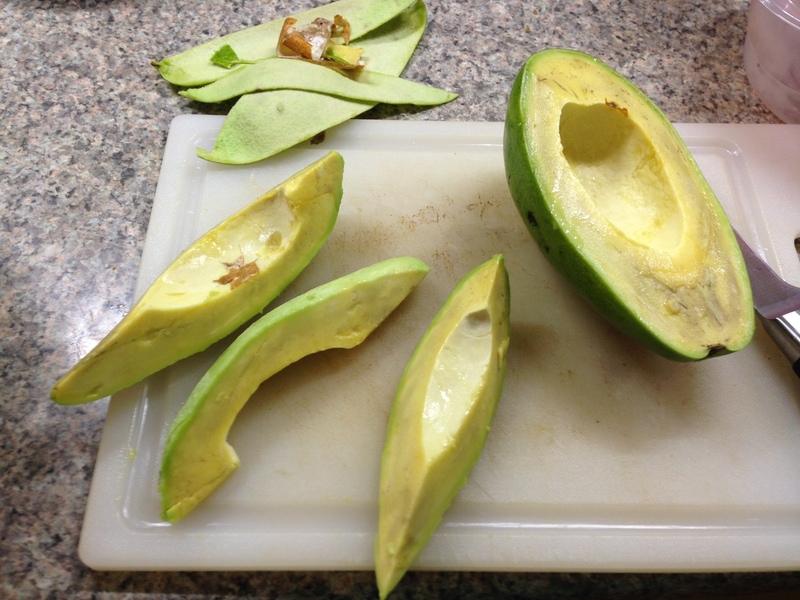 What are healthy fats, you ask? It’s too hot for me to word a good explanation. I’ll let The Academy of Nutrition and Dietetics explain. They are the professionals, after all. Hot weather might make you loath to turn on the oven. Very hot weather might make you cringe at the prospect of standing over the grill. You can still keep your DIYet no matter the atmospheric conditions. What is your go-to heatwave meal? Share in the comments! I make a big green salad and then add cut up deli bits, or tuna salad, or chicken salad. Or I have a snacky plate with fruit (stonefruits this time of year), cheese, meat, and crackers. I wish I liked cold cooked shrimp, they’re a great source of quick, lean protein. Indeed, sometimes grazing is preferable to meal-ing in the heat.